Martin Solomon talks about Boston’s famed medical institutions like a refugee returning to a once-idyllic, now war-torn city. Though the names of the old Harvard teaching hospitals – Beth Israel, Deaconess, Brigham, Mass General – still resonate with prestige, the truth is that the days are gone of academic camaraderie, unfettered patient access to any specialist and any institution, and treatment of almost any condition at any cost. Now, hospitals have merged, patients must not leave prescribed networks, and doctors must adhere to the bottom line at all cost. Patient care, Solomon says, has been negatively impacted. “We’ve gone from being the Mecca of medicine to a medical Beirut,” he says. With his trademark bow tie, Solomon cuts a slight figure as he goes on his rounds at Beth Israel Deaconess, the hospital that resulted from the 1996 merger of two famed Harvard teaching hospitals under the aegis of the CareGroup corporation. In the quiet, early morning hallways – Solomon starts his daily rounds no later than 5 a.m. – the doctor carefully checks in with his hospitalized patients, reviewing their treatments and medications. Then he goes to his Beacon Street office, opening it up for a first patient visit by 7 a.m. For the next 10 hours, he will see on average 35 patients, receive 100 phone calls and answer 50 email messages. He seems tireless. For that immense load, Solomon has been rewarded with recognition that few primary care doctors achieve in their local community. 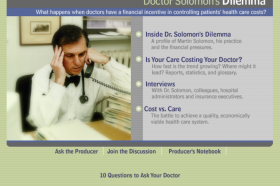 If a patient at Beth Israel does not have Solomon as a physician, chances are they’ve heard of him. He’s a native Bostonian, received his medical degree from Tufts University, and did his residency at the old New England Deaconess. He has one of the largest primary care practices in Boston. He’s been rated as the best family physician in Boston by Boston Magazine several times in a row. And he is the doctor to many Beth Israel Deaconess physicians. Solomon’s renown has meant that he is often tapped for leadership rolls within the hospital. One of his newest titles: Pod Leader. It may sound alien, but it is this role that has thrust Solomon and many other doctors into a new gray area, where physicians are making health care decisions for their patients based not just on treatment criteria, but on financial criteria. In the United States, it is estimated that 60 percent of doctors are at some financial risk for the cost of care of their patients. The numbers are growing, increasingly forcing doctors to ask tough ethical questions about the quality of the treatment they give if they must also consider its cost. Dr. Solomon sold his medical practice to CareGroup in 1998, meaning that he committed to sending his patients to Beth Israel Deaconess (BID) for medical care. Around the same time, doctors in the CareGroup system, including Solomon, began to manage the financial risk of many of their patients, effectively taking on the role previously held by HMOs. Doctors wanted the control over care decisions, which they had ceded to managed care companies during the 1990s. But they also wanted a part of the profits HMOs had received by forcing doctors and hospitals to cut costs and become more efficient. CareGroup doctors, like doctor groups in other areas of the country, have tried to force themselves to become more efficient by pushing the financial risk as close to the doctor as possible. Pods, small groups of doctors, are the result. 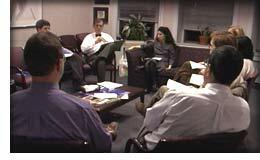 During bi-weekly pod meetings, Solomon presides over discussions centered primarily around keeping costs down: Applying peer pressure to minimize out-of-network referrals; educating doctors to prescribe cheaper prescriptions; encouraging colleagues to cut back on diagnostic testing. Pod discussions are often centered around doctor performance data, collected electronically by the hospital, to see who can save the pod money. Every prescription, every referral, every test ordered by these physicians is documented, tabulated, collated and then distributed as a report card to the doctors. Minutes later, Solomon goes to the waiting room of Dr. Pastor’s office, where 10 of the 11 Pod physicians sit in a circle to discuss patients. What is quickly apparent is that the majority of the discussion is not about the actual care of the patient, but the cost of the care. News is received on three fronts. First, the physicians talk about “leakage,” or doctors letting patients go to a rival, out-of-network hospital, where everything done to the patient is out of the care and financial control the primary care doctor. (“It’s okay to say ‘No,'” says Solomon). Next comes a pharmacy specialist from the hospital, who is making pod visits to hand out efficiency scores and talk about ways of doing a better job of keeping costs in line. Finally, Dr. Susan Frankl, a member of Pod 11 and designated “medical director” for the Secure Horizons Medicare contract – which has put these doctors at 100 percent risk – gives a report on the pod’s financial performance during the third quarter of 1999. The results are not good. There is a collective gasp in the room. The Pod discussion is a long way from Solomon’s medical training at Tufts Medical School, where he was taught that cost was no concern when it came to treating patients. But even back then, Solomon knew that there were problems in the system that would someday have to be addressed. Two books he read influenced him to start thinking in less black-and-white terms about health care delivery: Who Shall Live? : Health, Economics, and Social Choice, written in 1974 by Victor R. Fuchs; and 1984’s Social Transformation of American Medicine by Paul Starr. Both foresaw a system of care under the fee-for-servicemodel that was set to collapse under its own weight of treatment excess and out of control costs in American medicine.